Our founder and Creative Director, Adam Blackwood, has a favourite saying, regularly heard in our office, which is “the devil’s in the detail”; this has since become not only our motto but a unique approach which is regularly commented on – and appreciated – by clients and suppliers alike. For Private Drama, “detail” is interpreted in two ways. Firstly, the attention to detail applied at every level from the very first ‘look and feel’ of our client proposals, through the carefully considered planning and development stages – the checking and double checking of each and every logistical detail, delivering the complex tech riders for our performers, interrogating each budget line item, recalling guests’ particular dietary preferences, ensuring compliance with the health and safely regulations, through to preparing comprehensive pre event briefs circulated to our event suppliers, until finally we are on site and all the months of meticulous planning play out, all the while keeping an ever watchful eye out to problem solve where necessary, combining to guarantee seamless delivery and flawless run of show – inspiring confidence in our clients and of course an unforgettable event experience for all their guests. With Christmas around the corner, this time of year brings its own particular pressures – the desire for new and innovative cost effective solutions, last minute requests, tight turn arounds, and of course juggling more projects than ever – whilst still maintaining our exceptionally high brand standards. We relish this challenge! The second way in which we interpret ‘detail’ at Private Drama is in our practice of designing each and every event to reflect our clients’ unique core message and weave into their event a number of subtle bespoke details which really tell their story – whether it be a corporate brand narrative or a private celebration for family and friends. An impressive venue, mouth watering cocktails and food, stylish staff, beautiful production and fantastic entertainment – so far, so expected. It is the combined effect of a number of tiny details particular to each individual client which makes their event so powerful. Some of my personal favourites from recent private events include the wedding of two young teachers for which we commissioned bespoke dining tables fabricated from huge blackboards, with chalk at each place setting and notes encouraging guests to leave personal messages for the couple; or for a birthday party whose host who had a particular passion for English wild flowers, we not only created elegantly labelled test tubes of English wildflower seeds as bespoke place settings but also designed beautiful table centres made up of potted seasonal English blooms which guests could take away at the end of the night and enjoy for weeks to come, or for a private party whose hosts love theatre, we created invitations featuring their initials entwined within a theatrical stage setting. 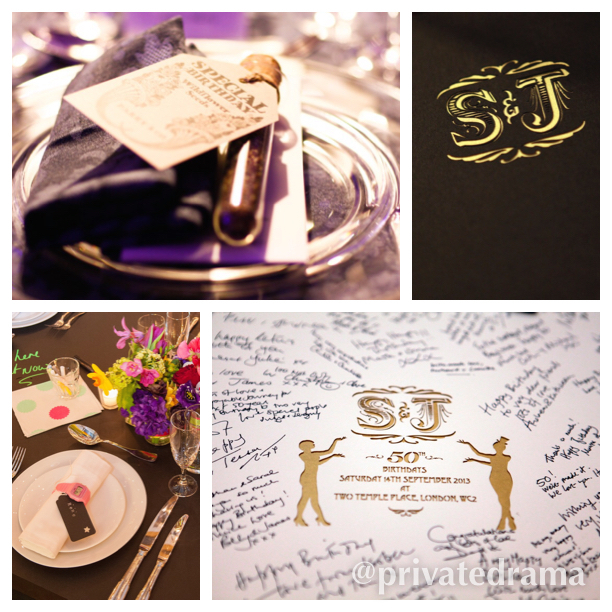 For corporate clients, we look to add in details that create an event identity and reflect the brand messaging. For example, for a corporate client in the construction industry celebrating a milestone 25 year anniversary, we reflected their “Spirit of Adventure” by creating a spectacular soaring aerial cirque performance which also cleverly mirrored the colour and styling of their flowing corporate logo in our use of bespoke brightly coloured aerial silks– at the same time, attempting a Guinness World Record for aerial silks by 25 performers performing a simultaneous choreographed routine – which we won! For Private Eye’s 50th Anniversary party, we decorated the Guildhall with two giant Lord Gnomes, a huge anniversary banner and a specially manufactured speech bubble placed in front of a statue of the Duke of Wellington, proclaiming his infamous quote – also particularly appropriately for this client – “publish and be damned!” As the assembled guests supped on champagne and canapés, a number of life size cardboard cut-out figures of politicians and celebrities who had been mercilessly satirised in past issues were a constant presence, keeping a watchful eye on proceedings from the balconies above. Our emphasis then on “The devil’s in the detail” is not only one of the ways in which our clients and suppliers are assured that our project together will be expertly managed and delivered from start to finish but also how we ensure that each and every event offers a unique, unforgettable once in a lifetime experience for event host and guests alike.